Olentangy Orange’s Ethan Adkins defends Delaware Hayes’ Brystin Coldiron (11) during the first half of Tuesday’s showdown in Lewis Center. Boyce, who passed away Mar. 5, would have entered his third season as Orange’s head coach after serving the previous four as an assistant. Peterson, meanwhile, had hung up his ballcap in favor of an administrative role as an assistant principal at Olentangy Liberty after going 67-34 in five seasons at Olentangy. The Pioneers will continue to honor Boyce with a patch on their uniforms and the No. 35 jersey spot reserved for him on the roster. As for the game, Brystin Coldiron had two goals and an assist, Blake Eiland scored twice and Connor Prenger added a goal and an assist to lead the Pacers to a 6-1 win over Orange Tuesday in Lewis Center. Peterson said he took the first week to observe and got together with the coaching staff to develop a game-plan. It was a lot to throw at the team in a short period of time. Coldiron used a pump-fake on both of his goals, including the Pacers’ first goal with 8:58 left in the first period to give Hayes a 1-0 lead. Hunter Piroska rounded out the scoring for the Pacers (1-0) and Tyler Carney stopped nine shots in goal. Tanner Davidson had 17 saves in goal for the Pioneers (0-1), who got their lone goal from Dylan Dempsey. “(Hayes has) a great face-off kid,” Peterson said. “I don’t know if we won a clean face-off and whenever you (give up) possession, you’re going to be in a difficult spot. 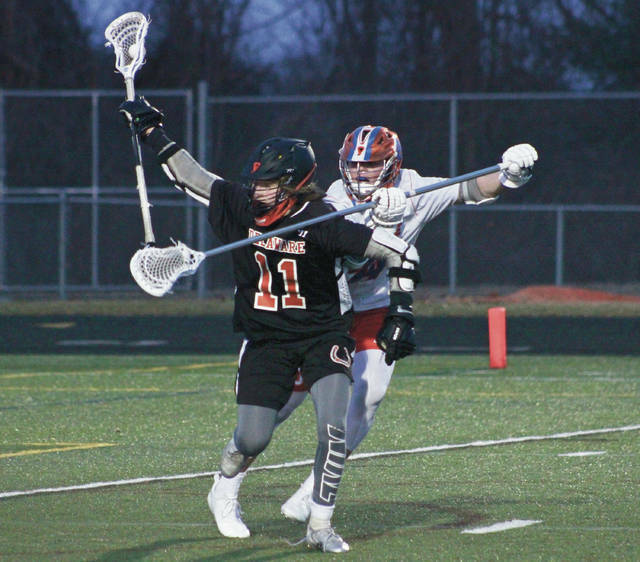 Next up, Orange hosts Olentangy Berlin in non-league play Thursday night at 7 p.m. Hayes is off until Monday when it opens its home schedule against non-league foe Bishop Watterson at 7 p.m.
Jack Nebraska had two goals and an assist to lead the Bears in the first game in the history of Berlin boys lacrosse Tuesday in New Albany. Gavin Angell added a goal and an assist while Drew Haver scored twice. Sam Warner finished with 19 saves in the Berlin goal. Olentangy Berlin’s Jenna Brennan had four goals and Andi Henry added a pair, but visiting Pickerington North was able to generate some offense of its own on the way to a 12-8 win Tuesday in Delaware. Bri Hibbits anchored the Bear defense with five saves in the setback.